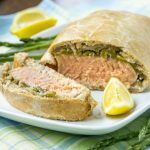 This easy Teriyaki Salmon recipe uses ingredients in your pantry to create an elegant dinner that is quick enough for a weeknight. 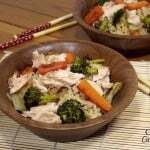 Most of us are pretty familiar with teriyaki. Teriyaki sauce is a frequent addition to stir fries in the States, and teriyaki chicken is often found in Asian restaurants. 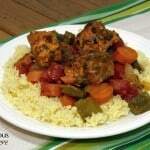 It is so commonplace, that it might seem odd to turn it into a fancy meal. But, who says simple can’t be elegant? Particularly when salmon is involved. What is Open That Bottle Night (#OTBN)? We’re glad you asked! Wall Street Journal wine columnists Dorothy J. Gaiter and John Brecher invented Open That Bottle Night as a world-wide celebration to open those bottles of wine that you’re saving. Maybe it’s one that has a special memory attached. Maybe it’s a really nice bottle. Maybe it’s just a wine you’ve been meaning to get to, but just can’t seem to get around to it. The last Saturday in February is THE day. It’s the day to open those long-saved bottles and savor them, remember the memories, and make new ones. Many people have Open That Bottle Night parties where each guest will bring a bottle they’ve been saving and as the bottles are un-corked, the story behind each wine is shared. Maybe next year we’ll have an Open That Bottle Night Party, but this year it was just the two of us. So, what was our bottle? We typically don’t hold on to bottles of wine for a long time, so a few years is about all a bottle will sit on our shelf. Because of this the bottle wasn’t a particularly old or memorable bottle. 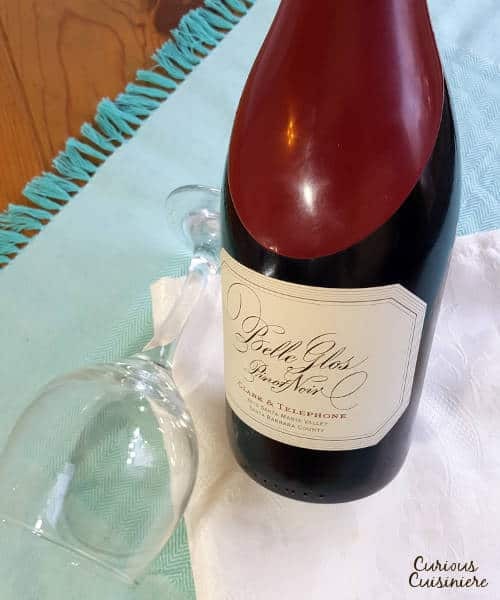 Rather it was a bottle that we were given by a friend that we have been meaning to find an excuse to drink for a while now: a 2013 Belle Glos Pinot Noir Clark & Telephone. Honestly, when we received the bottle, we didn’t know anything about the wine, but what we did notice was that the top was sealed with wax, which we found pretty impressive. Belle Glos is a California wine-making company that specializes in single-vineyard Pinot Noir wines. They own a number of vineyards along the Pacific coast, and each variety of Pinot Noir that they produce highlights the differences that climate and soil can make even to the same variety of grape. We found the Pinot Noir to be pleasantly spicy on the nose, but more fruity on the palate with just a hint of the spice we were expecting. We loved the way the wine was dry on the front end and then finished clean, with a lingering flavor of blackberry and cherry. With the balance of dryness and acidity and the fruity finishing notes, we could have sipped this wine alone and been perfectly content. But, it was equally delicious paired with the Teriyaki Salmon. 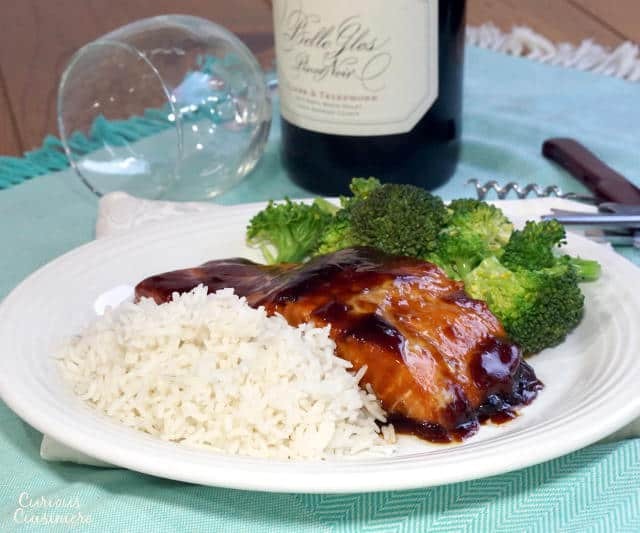 We loved the way the Pinot Noir paired with the salty and sweet teriyaki flavors and the robustness of the salmon. 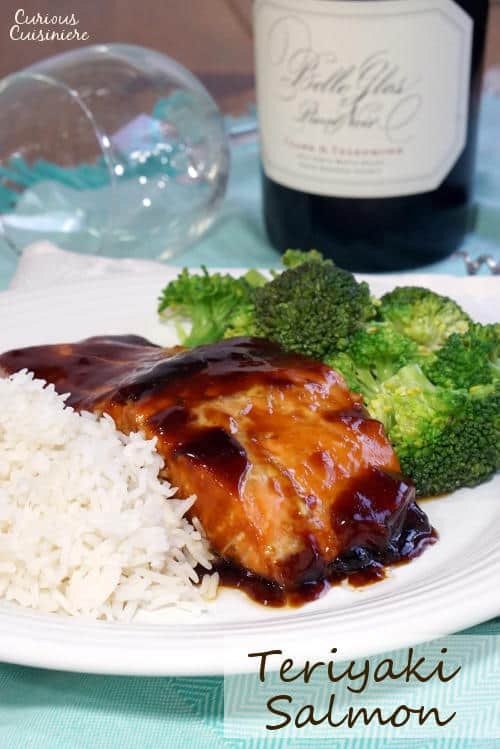 The teriyaki sauce also worked to bring out the warm spicy notes in the wine and the rich salmon accentuated the smooth finish of the wine. All in all it was a wonderful pairing and a fantastic way to celebrate this much anticipated bottle of wine. Mix the soy sauce, cooking sherry, molasses, honey, white vinegar, and ginger together in a 9" skillet with high sides. Heat the mixture over medium-high heat, 1-2 min, until it begins to simmer. Reduce the heat to medium. In a small bowl, mix the cornstarch with 1 Tbsp water, until smooth. Pour the cornstarch into the skillet and mix until combined. 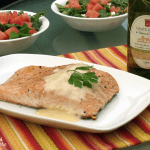 Add the salmon fillets to the sauce. Spoon some of the sauce over the filets, then cover the pan. 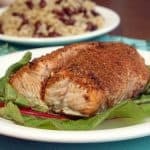 Cook the fish over medium to medium-low heat until the fish is flaky, 4-6 min (depending on the thickness of the filet). 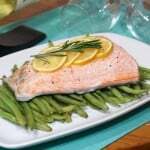 Serve the salmon with rice and steamed vegetables. 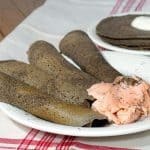 *Although these do add a different flavor, in a pinch it is acceptable to use Madeira or Marsala wine instead of Sherry. To see what bottles the rest of the Wine Pairing Weekend crew was keeping on their shelves, have a look at the pairings below. I’ve been looking for a teriyaki salmon recipe . . . trying to eat more fishies!! Anxious to try it. Cheers! You are right. A bottle doesn’t have to be “old” to qualify for #otbn. We have plenty that are ready to drink but we keep saving them for something special. I bet your friends are glad you went for it and opened that bottle. It definitely was the perfect bottle for #OTBN! I love Salmon Teriyaki and I bet that Belle Glos which has plenty of fruit was indeed wonderful with the dish! Sounds like a wonderful OTBN! It was a very nice pairing. Thanks Martin! It was a bit tricky to open the waxed bottle. We were glad when we finally got it! 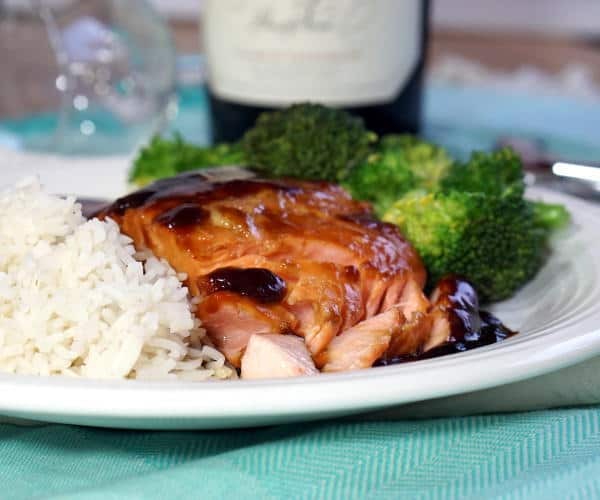 Salmon and Pinot Noir…a classic pairing. Looks delicious! Great pairing. I love salmon and Pinot Noir. 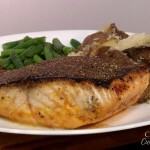 I love salmon and pinot together! Sounds like a good version of both!